For those uninitiated in the arcana of far-left discourse, I must digress for a moment. Please bear with me. The critique offered here is a matter of extreme political urgency, because if we cannot unite the Left in an effective anti-fascist movement, the risk is that humanity will be overwhelmed in a deluge of barbarism. It is that serious. Fascism is now a clear and present danger. And to build the mass social movements we need to stop the Far Right, we must – must – learn the lessons of history. So please bear with the digression. … once they [the Nazis] are in power, the united front of the working class will emerge and make a clean sweep of everything … We are not afraid of the fascists. They will shoot their bolt quicker than any other government. This was the official position. The KPD was by this time a monolithic organisation that took its orders from the Russian dictator Stalin. All members, high and low, were expected to peddle the same line. There was little room for independent thought, let alone open dissent. No-one survived for long as a party member in open defiance of the dominant theory of ‘Social Fascism’. According to the theory, the main enemy was not the Nazis (who won 6.4 million votes in 1930), but the Social Democrats (with 8.6 million votes). The Communists (4.6 million votes) spent most of their time attacking the Social Democrats, seeking to replace them as the main party of the German working class. The madness afflicted the KPD from top to bottom. In August 1931, for example, when the Nazis initiated a referendum in an attempt to overturn the discredited, right-wing, pro-austerity SPD government of Prussia, the response of the Communists was to campaign alongside the Nazis against the government in what they described as a ‘red referendum’. The referendum was lost, but the Nazis raised their profile, gained popular support, and moved politics to the right. The KPD, on the other hand, had weakened itself and the labour movement by driving a wedge between the Communists and the SPD-supporting workers. In the July 1932 general election, the Nazis got 13.7 million votes, 37% of the total, and became the largest party in the Reichstag. The combined vote of the workers’ parties, the SPD and the KPD, was slightly less, at 13.2 million (36%). So the Nazis had failed to ‘decline and fall’, as the Communist leadership had predicted. Now it was no longer a matter of the Nazis having passed their peak. On the contrary, the Communists expected them to take power. But they would not last, and their brief rule would be but the prelude to socialist revolution. ‘After Hitler, our turn,’ proclaimed Thälmann. Hitler came to power in January 1933. The Nazi dictatorship destroyed the German labour movement and went on to launch a world war and murder millions in the death-camps. It is possible – very possible – that had the Communists formed an alliance with the Social Democrats to fight Fascism in 1932, Hitler could have been stopped. Does any of this sound familiar? Britain’s EU Referendum was an initiative of UKIP and the Tory Right. The Leave campaign was dominated by anti-migrant racism. To talk of ‘Lexit’ and ‘People’s Brexit’ in this context is no different from the German Communists proclaiming the 1931 vote in Prussia to be a ‘red referendum’. And the effect has been similar: to strengthen the Far Right and drive a wedge between the Lexit Left and the mass of progressive workers and youth, who voted, with sound political instinct, Remain. But the Lexit Left has learnt nothing. Just like the German KPD, each political development is interpreted through the prism of their own sectarianism. 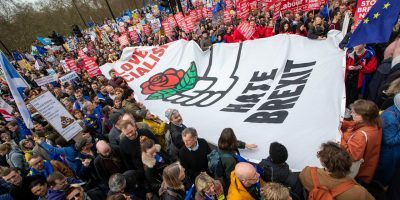 The anti-Brexit march on 23 March 2019 – one million strong – was the second biggest demonstration in British history. 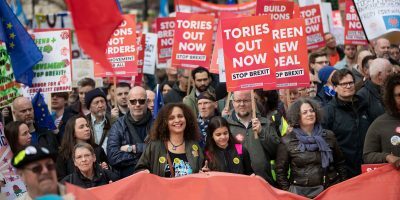 Prior to that, the anti-Brexit march on 20 October 2018 – 700,000 strong – had been the second biggest. Only the mass mobilisations of the Stop the War Coalition in the 2000s can compare in scale. But with a crucial difference: the Left led the anti-war movement, whereas the Left has ceded leadership of the anti-Brexit movement to Tories, Liberals, and Blairites. This is then used to attack the anti-Brexit Left, who are accused of being in alliance with pro-austerity neoliberals. The echoes of KPD attacks on the pro-austerity SPD in the early 1930s Germany are – if you know the history – deafening. Let us be clear. Brexit is the British expression of the wave of nationalism, racism, and fascism sweeping the world. Brexit is a clear and present danger to every EU migrant living and working in Britain. Brexit is a green light to every closet fascist who wants to punch a Muslim (or worse). Brexit is the political lightning-rod of Tommy Robinson, Nigel Farage, Boris Johnson, Jacob Rees-Mogg, and their following of street thugs and bar-room bigots. Whereas, on the million-strong march, the vast majority were internationalist, multicultural, and progressive in outlook. Especially the young people, who are now and always have been, instinctively and overwhelmingly anti-Brexit. The leadership of this movement has been usurped by neoliberal exponents of corporate power, privatisation, and austerity. It has been usurped by a corrupt, stale, self-serving political elite. Corrupt in the sense that they have sold themselves to the corporations. Stale in that they are content to echo the failed neoliberal mantras of Thatcher and Blair. Self-serving in that they represent nothing so much as their own tawdry careers. But the Left has allowed them to usurp that control – by abdicating from the leadership of one of the biggest progressive movements in British history. With the Far Right on the offensive, the Lexiters turn their fire on liberals and social-democrats – just like the German KPD in the early 1930s. 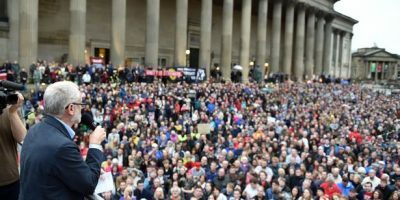 Instead of supporting the anti-Brexit movement as a progressive, multi-cultural, anti-racist mass movement which the Left should be trying to influence, they turn their backs on millions of ordinary people, including millions of young people, black and white, women and men, who should be the audience for any serious anti-fascist Left. 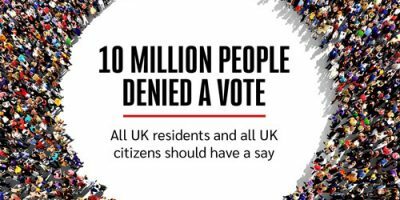 Brexit can also bring democratic renewal and hope that the country needs. Our young people can live in an independent nation that is forward-looking and open. One in which the engagement of all of us in the political life of the nation is welcomed and not feared. Come and discuss the opportunity Brexit gives us to free our country from the straitjacket of the last 40 years. ‘Our country’? Didn’t Marx teach us – in The Communist Manifesto of 1848 – that the workers have no country? Didn’t he argue that the working class is an international class and that workers of all countries should unite? Aren’t nations constructs of the capitalist state? Aren’t borders inherently racist? ‘An independent nation’? Are workers living under the rule of bankers, bosses, landlords, and police ‘independent’? Since when is social emancipation achieved by retreating into a national silo in company with Nigel Farage, Boris Johnson, and Jacob Rees-Mogg? This seems to be the vision. One of the national tour speakers is Maurice Glasman, a Labour peer, who writes in the Morning Star that ‘Tories such as Jacob Rees-Mogg are doing the work of socialism by supporting the primacy of democratic sovereignty.’ Glasman is an advocate of ‘Blue Labour’ social conservatism – a collapse into anti-migrant, anti-feminist, anti-LGBT bigotry. As the institutions of the working class and their jobs have been removed, some of those institutions have been taken over by liberals, and that is a problem for us. Whatever you think of people that turn up for those Tommy Robinson demos or any other march like that, the one thing that unites those people, whatever other bigotry is going on, is their hatred of the liberal left, and they are right to hate them. Right to hate them. Right to hate people who support migrant rights, women’s rights, LGBT rights, civil rights, democratic rights. What otherwise is the implication? And this seems confirmed when we discover, from his online posts, that Dempsey is an unreconstructed Stalinist. In relation to the purges and the gulags of the 1930s, he says, ‘He did it all. So what? We would do it again if we got the chance.’ And he shares a cartoon depicting the murder of Trotsky, the anti-Stalinist revolutionary, captioned ‘Roses are red. Trotsky is dead. Ramon put an ice-pick in the c***’s head.’ The thuggery, sectarianism, and misogyny are unashamed. Meanwhile, fascists, Tories, racist police, and the tabloid press are ramping up the attacks on asylum-seekers, migrants, Muslims, and EU workers living in Britain. And another of socialism’s most basic principles is violated by the Lexit Left: that you stand in solidarity with the most powerless, that you act as ‘tribune of the oppressed’, that you fight to tear down borders and defend free movement. The German Communist Party in the early 1930s was a mass organisation of hundreds of thousands of members supported by millions of voters. It was destroyed, along with the entire German labour movement, the most powerful in Europe, by the Nazi dictatorship in the first year of Hitler’s rule. That was tragedy. The Lexit politics of the British Left’s tiny, divided, brainless sects today – repeating the madness of Third Period Stalinism in microcosm – can only be described as farce. They have now completed the transition from revolutionary socialist internationalism to a variant of national socialism. They have abandoned Marxism and turned themselves into nationalists. ‘Socialism in one country’ was, of course, the ideology of Stalinism in the 1930s – the ideological cover for a counter-revolution by the emerging party-state bureaucracy in the Soviet Union which destroyed all remaining traces of the revolutionary-internationalist workers movement that had carried out the Russian Revolution of 1917. A version of this – ‘the alternative economic strategy’ – was the property of a large section of the British Left in the 1970s. It was the idea that you could retreat into a national silo and build a socialist economy in isolation from – and in defiance of – the rest of the world. It was a fantasy then – the Labour government of the 1970s was derailed by international finance – and, with the economic leverage of the state further eroded by the power of globalised corporate capital, it is even more of a fantasy today. So, given that a large chunk of the sectarian Left has forgotten the ABC of socialism, here is a quick lesson in Marx for Beginners. 1. Nations and nationalism are constructs of the capitalist state. 2. The workers have no country and internationalism is their creed. 3. Capitalism is a global system and socialism in one country is a fantasy. 4. International working-class unity is the basis of the struggle for social transformation. 5. Nationalism and racism divide the working class. That is why socialists stand with the oppressed against the Tories, the fascists, and the police. That is why socialists say: all migrants are welcome here, and all Muslims are our brothers and sisters. 6. Brexit is the British expression of the tidal wave of nationalism, racism, and fascism sweeping the world. Let the ruling classes tremble at a communist revolution. The workers have nothing to lose but their chains. They have a world to win. Workers of the world, unite! If the capitalist states of Europe succeeded in merging into an imperialist trust, this would be a step forward as compared with the existing situation, for it would first of all create a unified, all-European material base for the working-class movement. The proletariat would in this case have to fight not for the return to ‘autonomous’ national states, but for the conversion of the imperial state trust into a European Republican Federation. This is the radical case for Remain – for ‘Another Europe’ – in a nutshell. The Old Left is dead. We must build a New Left. And fast. Creeping Fascism: what it is and how to fight it by Neil Faulkner, Samir Dathi, Phil Hearse, and Seema Syeda has just been published by Public Reading Rooms.